Will Alberto Fujimori be set free? On April 7, 2009 former Peruvian president Alberto Fujimori was convicted for human rights violations in three cases: the Barrios Altos massacre, the forced disappaearance of nine students and a professor from La Cantuta University, and the kidnappings of journalist Gustavo Gorriti and Samuel Dyer. The legal proceedings against Fujimori demonstrated beyond reasonable doubt that he was the key architect of a state plan to eliminate suspected subversives and opponents of his regime. He was sentenced to the maximum penalty in Peruvian law, 25 years. The verdict was ratified on December 30, 2009 by a tribunal comprised of five Supreme Court justices. This was the final appeal, and the ratification means that Fujimori’s sentence of 25 years is firm and not subject to further appeal. Moreover, the guilty verdict against Fujimori has been hailed by international legal scholars such as Kai Ambos and Juan Mendez as a milestone in global justice efforts to end impunity and guarantee accountability for crimes against humanity such as forced disappearances, extrajudicial executions, and torture. Fujimori did not question the impartiality of the judges nor did he impugn the proceedings against him while they were taking place. 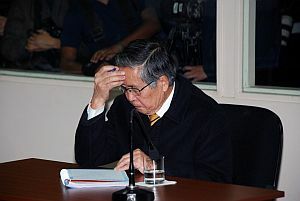 However, after the first sentence was ratified in December 2009, Fujimori and his allies launched a political and legal strategy to question the legitimacy of the verdict. This is because for the political project of fujimorismo, the release of Alberto Fujimori is an essential objective. Given the history of fujimorismo, especially its manipulation of the Judiciary and its trampling on democratic institutions to achieve its objectives, there is major concern among democracy and human rights activists that Fujimori could be freed using questionable methods. There are two avenues by which Fujimori’s supporters have sought to have their leader released. The first is via a presidential pardon. Since the initial verdict was handed down the question of whether or not the current president, Alan Garcia, would pardon Fujimori (presumably in exchange for a future promise of protection from prosecution for human rights violations committed during his first governmetn) or whether his daughter, should she be elected president in 2011, would pardon her father. From the day of his conviction, Keiko Fujimori repeatedly stated that her “hand would not tremble” to pardon her father. However, there are significant problems with this avenue. Peruvian law prohibits pardons from being granted to those convicted of aggravated kidnapping, as was the case with Fujimori. International law prohibits pardons from being granted to those convicted of crimes against humanity; the judges clearly stated in their verdict that the crimes of aggravated homicide, assault and kidnapping of which they found Fujimori guilty are crimes against humanity in international law. Moreoever, it would be costly politically to grant Fujimori a presidential pardon. The vast majority of Peruvians now believe Fujimori was guilty of these and other crimes, the Fujimori sentence is viewed positively by two-thirds of the Peruvian population. It is perhaps for this reason that Keiko Fujimori has recently pledged not to pardon her father if elected. Her change of heart may be related to her faith that a second avenue to freeing her father is still available: a legal strategy that seeks ultimately to overturn to overturn the Fujimori conviction. To this end, Fujimori’s lawyers have submitted no less than 17 writs of habeas corpus to Peru’s Constitutional Tribunal (TC). The TC has agreed to hear at least one of these writs of habeas corpus, but has stated that it would wait until after the presidential elections to emit its ruling. This habeas corpus essentially challenges a ruling that denied Fujimori’s petition alleging that the Supreme Court judges named to review his appeal of the April 2009 verdict were not impartial and requesting their removal from the case. Human rights lawyers note that while the TC has handed down very important rulings in the years since Peru’s democratic transition in 2000-2001 that established important human rights jurisprudence in Peru, in recent years it has handed down several rulings that move away from some of this jurisprudence that represent a backsliding in efforts to combat impunity (for example in 2010 the TC ruled that crimes it had previously considered crimes against humanity, in which no statutes of limitations can apply, were in fact simple crimes and that statutes of limitation did apply). If the TC were to accept the argument outlined in the writ of habeas corpus, it would amount to a revocation of the ratification of the original sentence, and a new trial would be held that could lead to Fujimori’s exoneration, or to a different sentence that could facilitate a presidential pardon. WOLA and its partners in Peru are deeply concerned at such a prospect, which is especially likely should Keiko Fujimori be elected president of Peru this Sunday. Should this comes to pass, not only is it highly likely that Alberto Fujimori will be freed; it is also probable that Vladimiro Montesinos, along with other members of the Fujimori regime currently serving prison time for corruption, drug and arms trafficking, and human rights violations will also be set free, and that a general amnesty will be put in place effectively ending attempts to achieve accountability for human rights violations committed in the context of Peru’s internal armed conflict. Such an outcome clearly puts Peru’s fragile democracy at risk. It would likely generate political and social discontent and instability, which could elicit the kind of repression and authoritarian practices of the Fujimori years that Peruvians have fought so hard so overcome. After having come close to winning the Peruvian presidential elections in 2006, Ollanta Humala will once again compete in the final round of voting this Sunday, June 5, to determine who will be Peru’s next president; this time however, the outcome is far less certain than was the case the last time around when he faced Alan Garcia. While Keiko Fujimori maintains a slight lead over Humala, the most recent polls have the candidates in a statistical dead heat, with less than one percentage point difference between them. If this trend remains unaltered on election day, then quick counts may not be able to discern a clear winner, and official results could be delayed for two weeks or more. This could escalate the existing climate of polarization that is a notable feature of this drawn-out electoral process.